Supermassive black holes, millions to billions of times the mass of our Sun, are found at the centers of galaxies. Many of these galactic behemoths are hidden within a thick doughnut-shape ring of dust and gas known as a torus. Previous observations suggest these cloaking, tire-like structures are formed from the native material found near the center of a galaxy. New data from the Atacama Large Millimeter/submillimeter Array (ALMA), however, reveal that the black hole at the center of a galaxy named NGC 1068 is actually the source of its own dusty torus of dust and gas, forged from material flung out of the black hole’s accretion disk. This newly discovered cosmic fountain of cold gas and dust could reshape our understanding of how black holes impact their host galaxy and potentially the intergalactic medium. “Think of a black hole as an engine. It’s fueled by material falling in on it from a flattened disk of dust and gas,” said Jack Gallimore, an astronomer at Bucknell University in Lewisburg, Pennsylvania, and lead author on a paper published in Astrophysical Journal Letters. “But like any engine, a black hole can also emit exhaust.” That exhaust, astronomers discovered, is the likely source of the torus of material that effectively obscures the region around the galaxy’s supermassive black hole from optical telescopes. NGC 1068 (also known as Messier 77) is a barred spiral galaxy approximately 47 million light-years from Earth in the direction of the constellation Cetus. 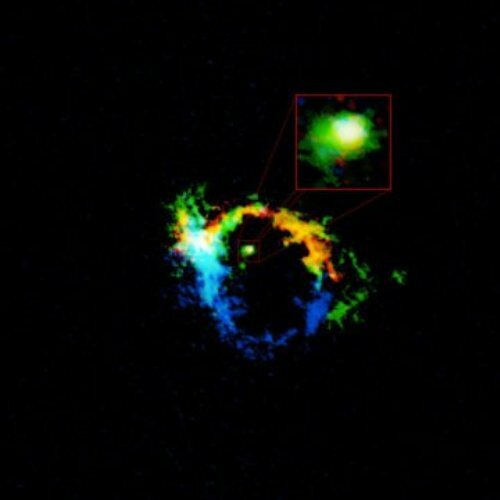 At its center is an active galactic nucleus, a supermassive black hole that is being fed by a thin, rotating disk of gas and dust known as an accretion disk. As material in the disk spirals toward the central black hole, it becomes superheated and blazes bright with ultraviolet radiation. The outer reaches of the disk, however, are considerably cooler and glow more appreciably in infrared light and the millimeter-wavelength light that ALMA can detect. Using ALMA, an international team of astronomers peered deep into this region and discovered a sprinkling of cool clouds of carbon monoxide lifting off the outer portion of the accretion disk. The energy from the hot inner disk partially ionizes these clouds, enabling them to adhere to powerful magnetic field lines that wrap around the disk. Like water being flung out of a rapidly rotating garden sprinkler, the clouds rising above the accretion disk get accelerated centrifugally along the magnetic field lines to very high speeds — approximately 400 to 800 kilometers per second (nearly 2 million miles per hour). This is up to nearly three times faster than the rotational speed of the outer accretion disk, fast enough to send the clouds hurtling further out into the galaxy. “These clouds are traveling so fast that they reach ‘escape velocity’ and are jettisoned in a cone-like spray from both sides of the disk,” said Gallimore. “With ALMA, we can for the first time see that it is the gas that is thrown out that hides the black hole, not the gas falling in.” This suggests that the general theory of an active black hole is oversimplified, he concludes. With future ALMA observations, the astronomers hope to work out a fuel budget for this black hole engine: how much mass per year goes into the black hole and how much is ejected as exhaust. “These are fundamental quantities for understanding black holes that we really don’t have a good handle on at this time,” concludes Gallimore.